Books will be on sale and signed at the time. 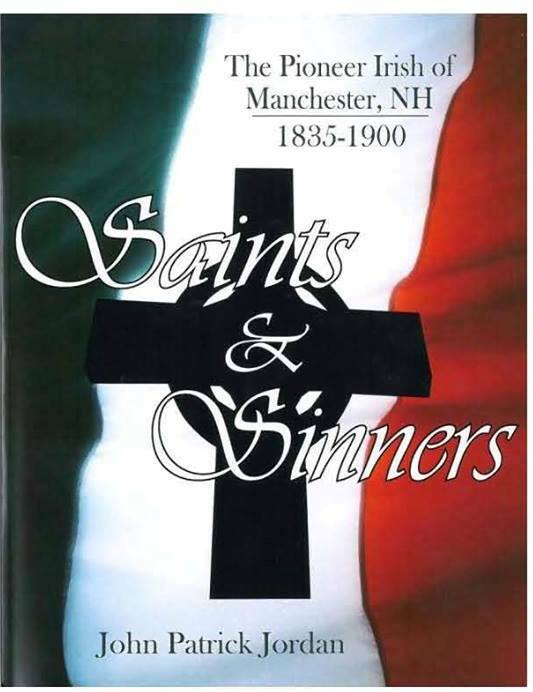 For more information contact Mary Gallant at 603-624-6550 ext. 311. Cash, checks and credit cards via Squareup.com are accepted. 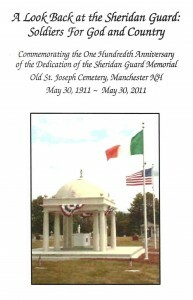 If you live in Manchester, you can watch the show live or check for rebroadcast on MPTS channel 23. For more information log onto http://pammanney.com. Check Your Hat! 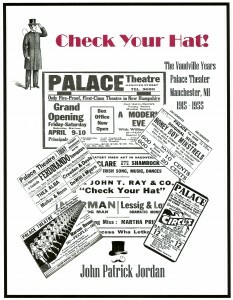 The Vaudeville Years of the Palace Theater, 1915 – 1955. John Patrick Jordan’s newest book, “Check Your Hat! 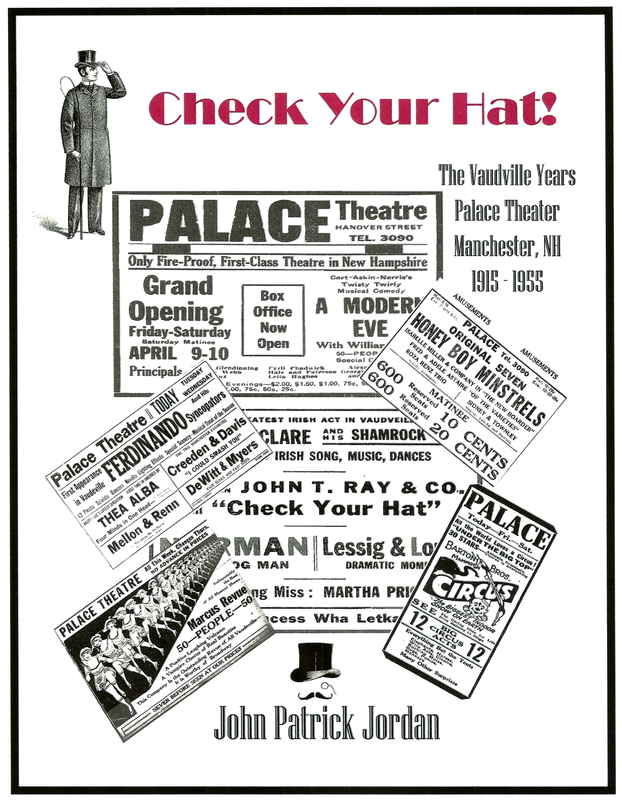 The Vaudeville Years of the Palace Theater, 1915 – 1955” is now available! 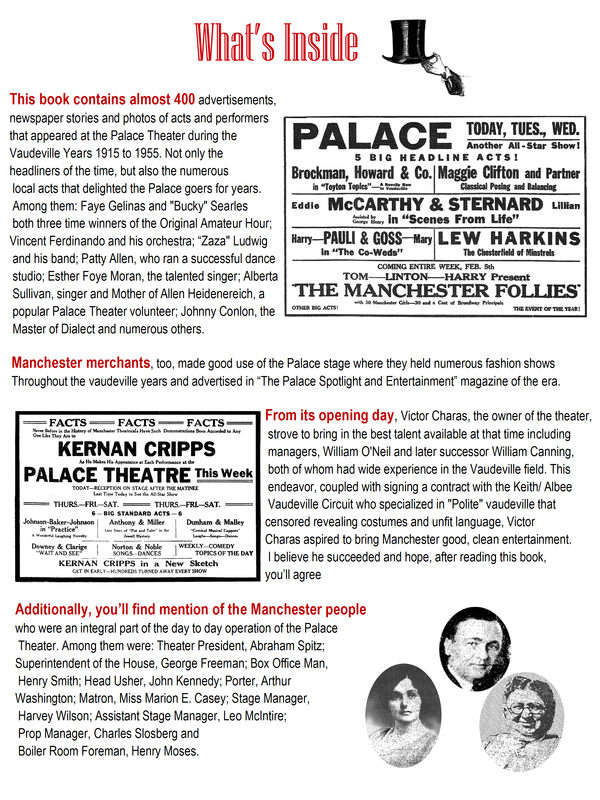 Manchester merchants, too, made good use of the Palace stage where they held numerous fashion shows throughout the vaudeville years and advertised in “The Palace Spotlight and Entertainment” magazine of the era. 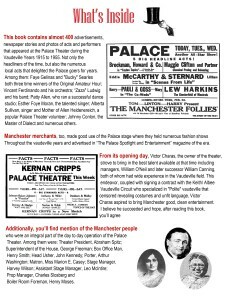 Additionally, you’ll find mention of the Manchester people who were an integral part of the day to day operation of the Palace Theater. Among them were: Theater President, Abraham Spitz; Superintendent of the House, George Freeman; Box Office Man, Henry Smith; Head Usher, John Kennedy; Porter, Arthur Washington; Matron, Miss Marion E. Casey; Stage Manager, Harvey Wilson; Assistant Stage Manager, Leo McIntire; Prop Manager, Charles Slosberg and Boiler Room Foreman, Henry Moses. From its opening day, Victor Charas, the owner of the theater, strove to bring in the best talent available at that time including managers, William O’Neil and later successor William Canning, both of whom had wide experience in the Vaudeville field. This endeavor, coupled with signing a contract with the Keith/ Albee Vaudeville Circuit who specialized in “Polite” vaudeville that censored revealing costumes and unfit language, Victor Charas aspired to bring Manchester good, clean entertainment. I believe he succeeded and hope, after reading this book, you’ll agree. Buy “Check Your Hat! today. Free delivery within 20 mile radias of South-east Manchester, NH. Posted on March 14, 2015 March 10, 2019 Categories John Patrick JordanTags Abraham Spitz, Adele Astaire, Al Lewis, Alberta Sullivan, Allen Heidenereich, Andriana Caselotti, Arthur Washington, Baby Rose Marie, Big Brother Bob Emery, Bill Bojangles Robinson, Bob Michaud Heating and Handyman Services, Bobby Jordan, Bowery Boys, Bucky Searles, Buster Brown, Captain Pop Anson, Charles Slosberg, Check your Hat, David Pichette Tax and Financial Services, Dead end kid, Ernest Sunshine Morrison, Esther Foye Moran, Faye Gelinas, Freckles Ray, Fred Astaire, Freddie Bartholomew, Funniest Woman in the world, Gene Autrey, Gentleman Jim, George Burns, George Freeman, Gracie Allen, Grampa Munster, Hardeen, Harry Blackstone, Harry Stockwell, Harvey Wilson, Henry Moses, Henry Smith, James Corbett, Jay R. Smith, Joe Besser, Joe Kelly Levasseur Attorney at Law, John Kennedy, John Patrick Jordan, Johnny Conlon, Keith Albee, Kelley Refreshment Service, Lavigne Distributors, Leo McIntire, Lester Smiley Burnett, Lillian Roth, Manchester NH, Marion E.Casey, Milton Berle, Our gang, Palace Theater, Patty Allen, Peaches Browning, Prince Charming, Raymond Langevin, Richard Duckoff, Rose Marie, Snow White, Vaudeville Years, Victor Charas, Vincent Ferndinando, William Canning, William O'Neil, ZaZa Ludwig, Zusa Pitts5 Comments on Check Your Hat! The Vaudeville Years of the Palace Theater, 1915 – 1955. Just a few hours left to sponsor! Don’t miss out! Thank you Joe Kelly Levasseur Law Firm! 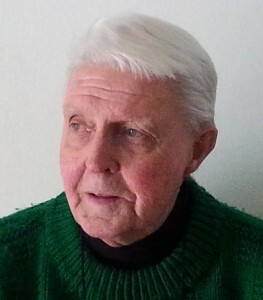 Thank you Joe Kelly Levasseur Law Firm, the latest sponsors of John Jordan’s upcoming book! We truly appreciate it! 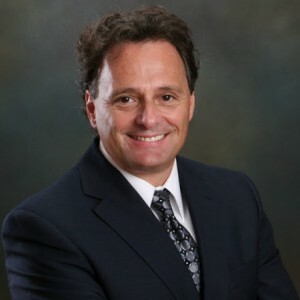 Please join Joe Kelly Levasseur Law Firm by sponsoring John Jordan’s book and have your name or business name published in his upcoming book, “Check Your Hat! The Vaudeville Years of the Palace Theater 1915 – 1955″planned to be published the end of February, 2015, just in time to celebrate the Palace Theater’s 100 year anniversary. Joe Kelly Levasseur Law Firm is located in Manchester, NH. They offer Experienced Auto – Motorcycle – Personal Injury Attorney in Manchester, NH. Aggressively Fighting for You! Call today! 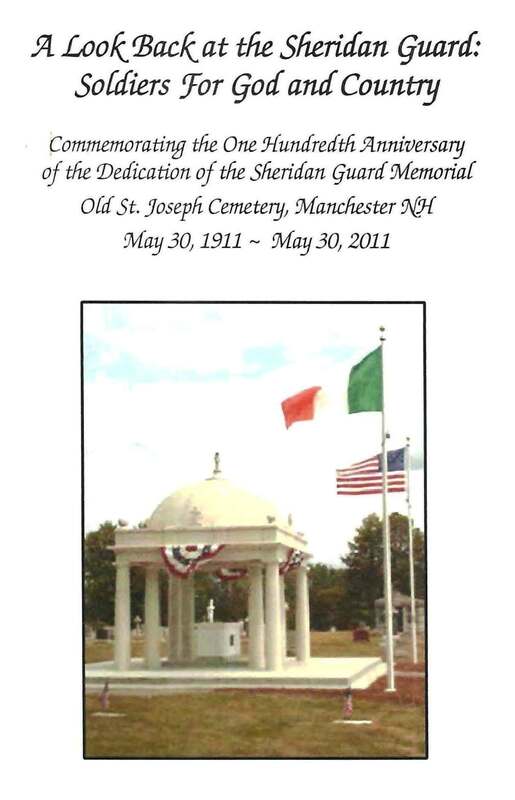 603-622-7575 or e-mail at jrwaa2@aol.com. GET YOUR NAME OR BUSINESS LISTED IN OUR SOON TO BE PUBLISHED BOOK. SPONSOR TODAY! DEADLINE TO SPONSOR IS TODAY MONDAY, FEBRUARY 23. Sponsor John Jordan’s book today – Sponsorships start at $50. Get your name or businesses published in our book! Log onto http://pammanney.com/?page_id=71 for more information. Thank you David Pichette Tax and Financial Services! Thank you David Pichette Tax and Financial Services, the latest sponsor of John Jordan’s upcoming book! We truly appreciate it! Please join David Pichette Tax and Financial Services by sponsoring John Jordan’s book and have your name or business name published in his upcoming book, “Check Your Hat! The Vaudeville Years of the Palace Theater 1915 – 1955″ planned to be published the end of February, 2015, just in time to celebrate the Palace Theater’s 100 year anniversary. 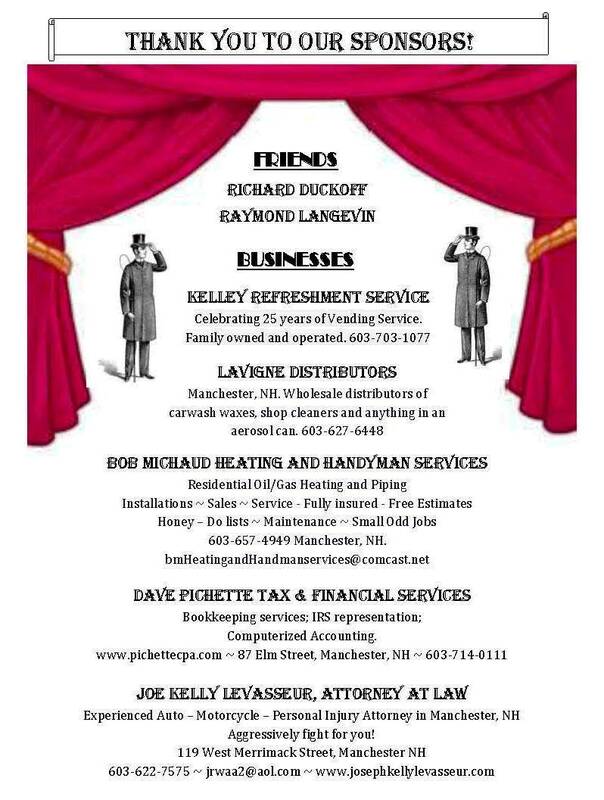 David Pichette Tax and Financial Services is located in Manchester, NH. DEADLINE TO SPONSOR IS THURSDAY, FEBRUARY 26.